There are so many incredible flavors in this dish, but the real star of the show is the cheese. This Parmigiano Reggiano from Whole Foods Market is aged for 24 months rather than just 12 months which develops wonderfully complex flavor. It's nutty, sweet, grassy, creamy, and fruity. And what it does to this sauce is simply magical! The cheese specialist at my Whole Foods hand cut what I needed from a fresh wheel, and she even cut off a little sample for me to nibble while she worked. It is rich, cheese perfection! Let me say this. I thought I knew good parmesan until I had this cheese. Y'all, I'm never going back. God's honest truth. Can't. Stop. Nibbling. Not only does a little go a long way, but when wrapped well in wax or parchment paper, a wedge of parm will actually last in the refrigerator for nearly a year! Although at my house, this parm would never last that long! Again with the nibbling. It's important to never freeze a whole wedge of parm, but you can certainly freeze it grated! And you can even drop the rind into your pots to add richness to your stocks and soups. Isn't that all good news?! Even better news is that Whole Foods is having a 3-day sale* on fresh parm! This Parmigiano Reggiano is worth every penny and notably elevates even easy weeknight pastas like this one! So save-pin-print-screenshot this recipe, run into your Whole Foods Market, order up a fresh wedge, and make this recipe for your people! Nibble a sample at the counter for me! Preheat oven to 425F. Lay pancetta slices on a parchment-lined sheet pan and bake for 10-12 minutes or until crisp. Remove, transfer to a paper-towel lined tray to let cool; then chop and set aside. Next, in a dry saucepan over medium heat, toast pine nuts for several minutes until fragrant and golden, stirring so they don't burn. Set aside. In a 3.5-4qt braiser or saucepan with high sides, saute garlic and chopped sage in butter over low heat until tender. Pour in the cream and milk. Whisk in the canned pumpkin. Bring to a simmer. Turn heat to low, and stir in the grated parmesan until melted. Season with salt and pepper. Stir in grated nutmeg. Be sure to taste for seasoning and adjust! Add the cooked penne pasta, stirring well to coat. 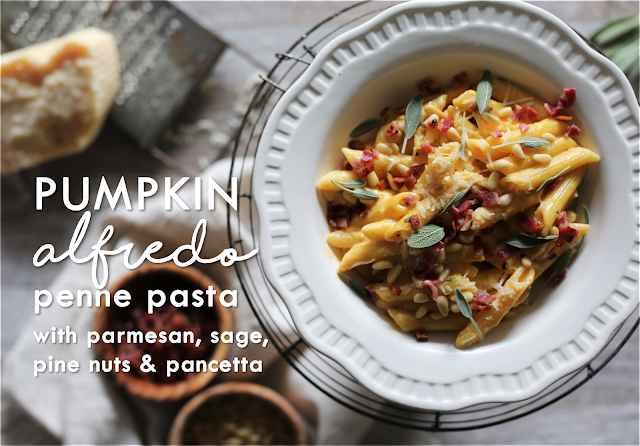 To serve, spoon pasta into shallow bowls, and top with crispy pancetta, fresh sage leaves, toasted pine nuts, and more Parmigiano Reggiano. I have a partnership with Whole Foods Market and have been compensated for my work, but all words and opinions are my own.